If your ideal holiday is one where you have no responsibilities and everything is done for you, then you need to keep reading. 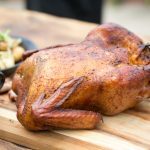 Imagine a holiday where you don’t have any decisions to make about what to eat, where to go or how to get there; you are simply served delicious meals, whisked to peaceful, picturesque places and left to your own devices. Sound heavenly? 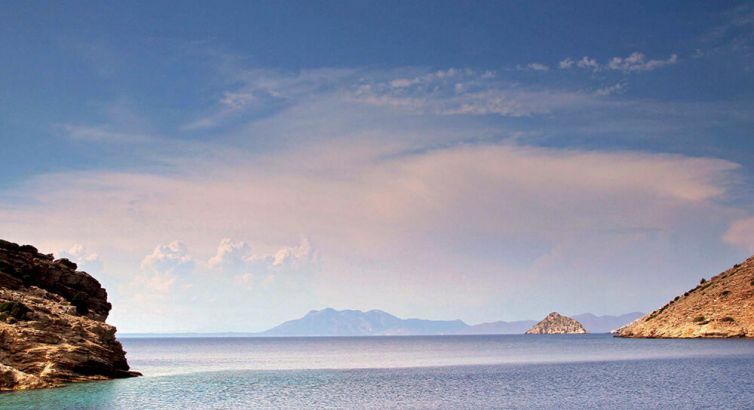 Then you’re going to love sailing the Greek islands and Turkish coastline on a private gulet yacht. Our trip began in Istanbul with a few days of sightseeing and shopping in Turkey’s ancient city. 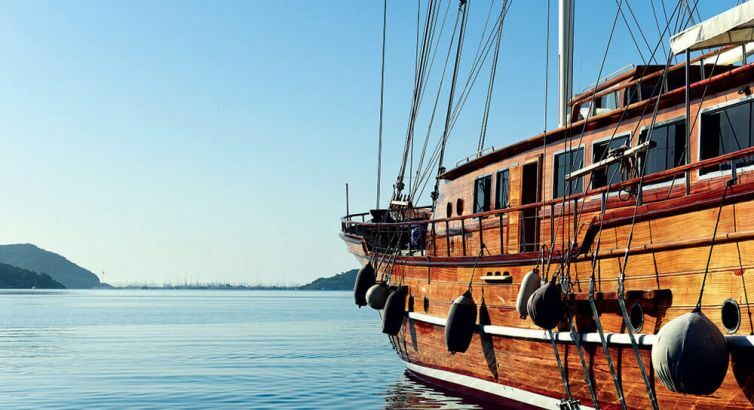 From there on a hot, late June afternoon, it was a flight to the Turkish port city of Bodrum to board the S.Dogu, a traditional Turkish wooden gulet. All gleaming mahogany and teak, polished chrome and towering white sails, this gorgeous 32-metre vessel would be home for the next seven days and nights. Its quarters consisted of six double cabins, all with air-con, en-suite bathrooms and hydro-massage showers. Surprisingly spacious, the gulet is designed with several lounging areas fore, aft and on the upper deck, upholstered in plush cream cushions, allowing our party of 12 a sense of unrestricted independence if we wanted it. S.Dogu’sfriendly and efficient crew welcomed us with refreshing G&Ts on the deck before it was all hands on deck to set sail out of the harbour and into the sparkling azure Aegean Sea. An hour or so of smooth cruising later, the captain steered her into a quiet cove and dropped anchor near shore for the night. With the sun still high in the sky, it was the first opportunity to jump into the warm turquoise water, its bed of pebbles clearly visible a mere 10 metres below. 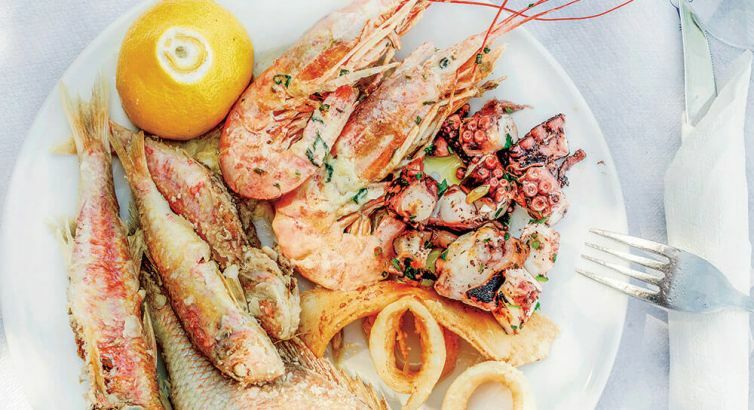 Sitting down at the table on the rear deck, surrounded by soaring cliffs and immaculate beaches, and tucking into a spread of freshly grilled fish, sautéed potatoes and delicious Turkish salads, you have to pinch yourself to ensure it is all real. That night, snug in our cabin, I dreamt of this heaven on earth. Awake early, after being lulled to sleep by the gentle rocking of the boat, we quietly climbed up to the top deck to savour the stillness of the morning. Muzey, one of two charming female crew members was on hand to offer us a choice of Turkish coffee or tea. This would be our morning ritual on the cruise. Unobtrusive yet friendly and attentive, the crew of seven made us feel at home yet pampered. Captain Ramazun Karayigit was the gulet’s knowledgeable and experienced skipper and each day he would discuss the day’s route, offering us the flexibility of setting our own course, which could include disembarking at a port town for shopping and sightseeing or, if we preferred, sailing into a private cove to spend the day swimming, snorkelling, exploring the shore and soaking up the sun on a comfy lounger. Watches are redundant on a holiday like this and it was not time but the rhythms of S.Dogu that determined our schedule: tasty meals magically appearing from the tiny galley below deck three times a day; the voyages from one stunning cove or port to the next; and the setting of the sun. The food prepared by the gulet’s skilled chef requires a special mention. For anyone a little apprehensive that a Turkish diet might not be to their liking, you’ll find any trepidation dispelled by the abundance of fresh, flavoursome fruit and vegetables, creatively concocted into delicious salads and cooked dishes incorporating yoghurt, cheese, eggs, rice and fresh herbs, accompanied by dishes of lamb, beef, fish, seafood and chicken, cooked or grilled to perfection. Every day a different array of appetising dishes would await us at breakfast, lunch and dinner, and for teatime, always a freshly baked cake! There were toys to entertain us – a powerful rubber duck, wakeboards, water skis, ringos and canoes – and many afternoons were spent playing backgammon and poker on deck. Of course, the best part was not being stuck in one place. Cruising to two or three new places each day meant an ever-changing backdrop of picture-postcard surroundings and the possibility of exploring new places on land. The Turkish coastline is strewn with ancient ruins and one of the inlets visited was Knidos. Once part of ancient Greece and a bustling city in 360 BC, it was devastated by an earthquake. An astonishing number of weathered marble columns lie scattered around the area and you can still get a sense of the complex architecture that once stood proud. Further along the coast was Datça, another great seat of civilisation in centuries BC and now a quaint seaside town. The men went in search of a traditional Turkish barber and the women to purchase some golden honeycomb, olive oils and soaps, Turkish cotton towels, gowns, silk scarves and kelim bags. We dropped anchor at Kos, our first Greek island, visiting the Castle of the Knights of Saint John with its rich history of Hippocrates’ teachings under the ancient plane tree. We spent the night in another private cove close by, before setting sail for the harbour of Nisyros Island the next day. Again, another picture-postcard setting – this time of a typical Greek island with its houses of whitewashed walls and blue trimmings, olive trees, and horse-drawn carriages. 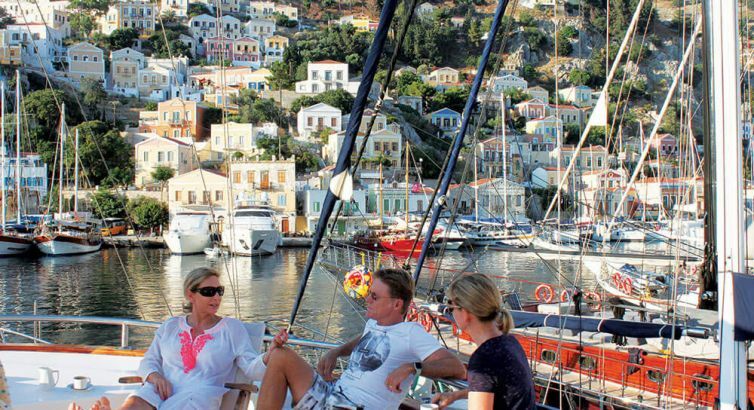 Sailing into the island of Symi at dusk, the pink-tinged sky was an unforgettable sight. 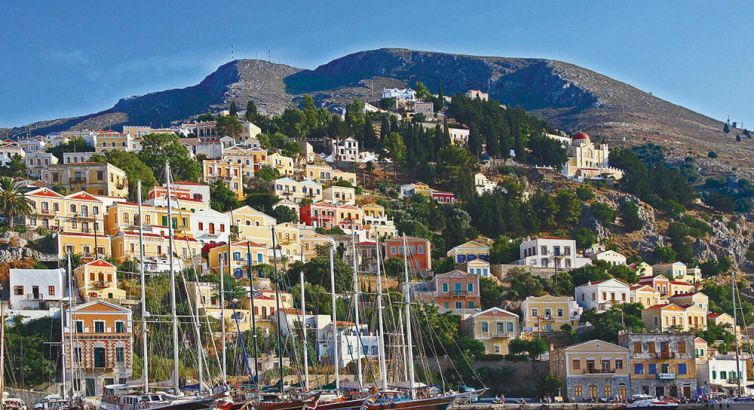 Widely considered the most beautiful harbour in Greece, its terraced hillsides wedged with tiers of small neoclassical houses in pastel hues of yellow, pink, blue and green, it was once one of the country’s most prosperous islands. We found a charming taverna on the beach a little walk from the boat and enjoyed a Greek dinner of meze and seafood. Our final night on board was spent anchored in yet another exquisite bay, not far from Bodrum where we would disembark. The crew lay on a feast of fresh prawns and fish with all the usual delightful accompaniments and we toasted our last night with a bottle of Akvavit schnapps, supplied by one of our Danish friends. The music played, we danced and celebrated life… a fitting end to a dream holiday. TRANSFER From the airport, request a transfer directly to the harbour through your gulet agent, or take a taxi from the airport to a designated spot on the harbour. The political situation in Turkey has calmed down after the terrorist attacks in 2015 and it is very safe to travel in and around the country. 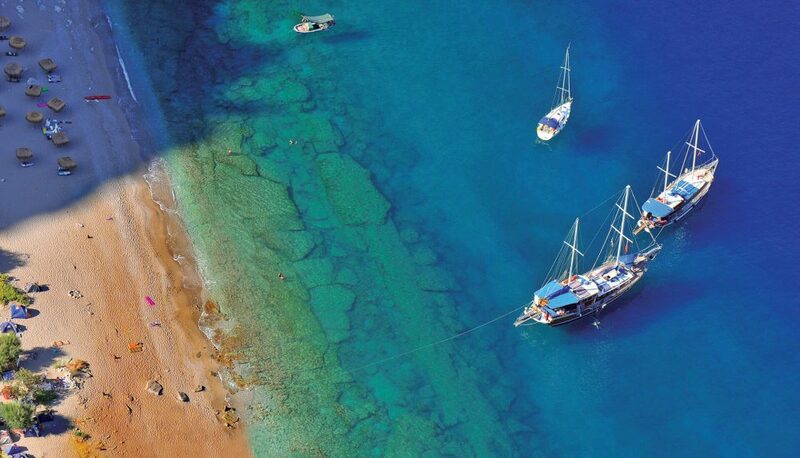 If doing a gulet trip, it is recommended that you are able to swim. Visit www.guletyacht.net for Budget, Standard, Luxury and Super Luxury options and to book a charter. The S Dogu is a Super Luxury Gulet that sleeps 12. 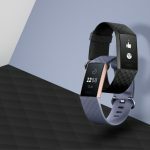 (2 000 euros per day). The cruising season is from April to October, with July/August being the peak. From ±1 000 euros per day. Food from 45 euros per person per day. Turkish and Greek cuisine share many dishes, often with similar names – stuffed vine leaves in Greece are dolmades; in Turkey they’re dolma. Traditional meals include yoghurt, cheese, vegetables, herbs, meat and seafood dishes. 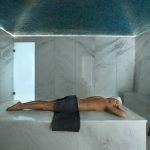 With around about 500 gulets plying the Turkish and Greek waters, you have lots of categories, sizes and combinations to choose from. A key fact to remember is you must tell the crew what you want to do. They will happily oblige but if you don’t tell them, they will just follow the route you requested. If you’d like to go ashore more, anchor further away from crowds, or visit archaeological sites, speak up. FLY on SAA’s daily direct flights to Frankfurt or Munich. 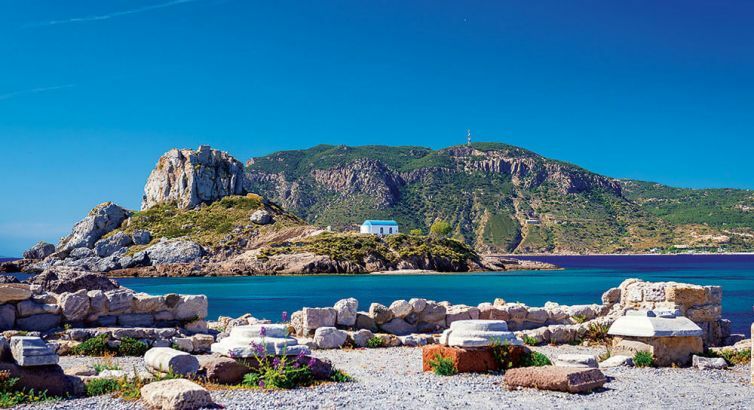 Connect to Greece and Turkey with SAA code-share partner and Star Alliance member, Lufthansa; or with Star Alliance members, Aegean or Turkish Airlines. Visit: http://www.flysaa.com.